Those of you that read this blog regularly know that I am a big fan of the library. However there are some books you just have to own. There are three such books that have been invaluble to me in my wine geekdom and form the core of my wine reference library. They are Oz Clarke’s Encyclopedia of Grapes by Oz Clarke [there is a newer paperback version out that is titled as Oz Clarke’s Grapes and Wines]; How to Taste: A Guide To Enjoying Wineby Jancis Robinson and Sotheby’s Wine Encyclopedia by Tom Stevenson. While my wine library has a lot more books, these are the ones I most often go to. More on these in future posts. 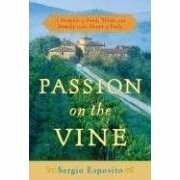 Continuing my summer reading I recently finished Passion on the Vine: A Memoir of Food, Wine, and Family in the Heart of Italyby Sergio Esposito which I picked up from FCPL. Every time I am in New York City I try to find a way to slip over to the Italian Wine Merchant: a store devoted to nothing but Italian wines, so I was really excited to see this book by the store’s founder. Part memoir, part travel guide, part my Big Fat Italian Family this book is a memorable account of how the author built his wine business through the unique relationships he forged with Italian wine makers and other personalities. Interspersed throughout is the tale of him growing up, first in Naples and then as an immigrant in upstate New York. His narrative about some of his family members had me laughing out loud at times- it especially resonated with my Italian-American heritage. An enjoyable read, my only complaint was it made me very thirsty! I am in the middle of reading three food related books, which I will probably post about as I finish them. What do they have to do with Frederick? Honestly, nothing except that I got them all from the Frederick County Public Library. The first one I have finished is Mediterranean Summer: A Season on France’s Cote d’Azur and Italy’s Costa Bella by David Shalleck. I just picked up this book on a lark, and I have to say I thoroughly enjoyed it. A light read it details the authors summer sailing as a chef for a wealthy Italian couple on their yacht as it travels the French and Italian Riveras and beyond. This memoir-travelogue-cooking book hit on three of my favorite things: the ocean/beach, food and Italy! The most impressive thing was how he cooked. Each morning he would put ashore and search the local markets, find what was local, fresh and in season and plan the days meals around that. It was great to read his thinking behind the creative process. As a top down cook (ie find a recipe, then search out the ingredients) who is striving to be more the other way, I was in awe of his ability to whip up a menu on the spot. There were some interesting recipes at the end of the book as well.